Here is What Hedge Funds Think About Apple Inc. (AAPL)? Most investors tend to think that hedge funds and other asset managers are worthless, as they cannot beat even simple index fund portfolios. In fact, most people expect hedge funds to compete with and outperform the bull market that we have witnessed in recent years. However, hedge funds are generally partially hedged and aim at delivering attractive risk-adjusted returns rather than following the ups and downs of equity markets hoping that they will outperform the broader market. Our research shows that certain hedge funds do have great stock picking skills (and we can identify these hedge funds in advance pretty accurately), so let’s take a glance at the smart money sentiment towards Apple Inc. (NASDAQ:AAPL). Apple Inc. (NASDAQ:AAPL) has seen an increase in hedge fund sentiment of late. Our calculations also showed that AAPL is also among the 30 most popular stocks among hedge funds though it isn’t in the top 5. In the financial world there are a large number of tools investors have at their disposal to grade stocks. A pair of the most under-the-radar tools are hedge fund and insider trading indicators. We have shown that, historically, those who follow the top picks of the best fund managers can outperform the broader indices by a solid amount. Insider Monkey’s flagship best performing hedge funds strategy returned 20.7% year to date (through March 12th) and outperformed the market even though it draws its stock picks from the small-cap universe. This strategy also outperformed the market by 32 percentage points since its inception (see the details here). That’s why we believe hedge fund sentiment is a useful indicator that investors should pay attention to. We’re going to take a gander at the latest hedge fund action encompassing Apple Inc. (NASDAQ:AAPL). What have hedge funds been doing with Apple Inc. (NASDAQ:AAPL)? Heading into the first quarter of 2019, a total of 116 of the hedge funds tracked by Insider Monkey held long positions in this stock, a change of 4% from the second quarter of 2018. 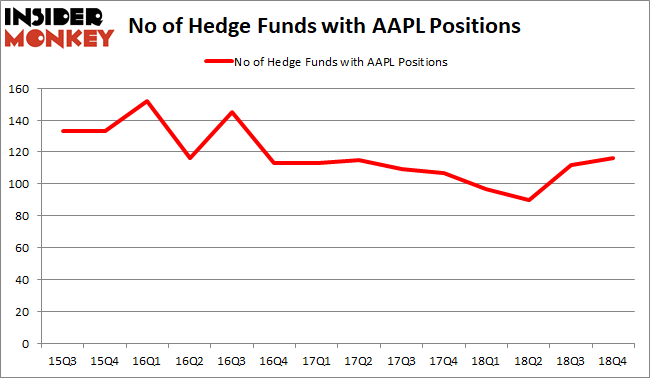 Below, you can check out the change in hedge fund sentiment towards AAPL over the last 14 quarters. So, let’s find out which hedge funds were among the top holders of the stock and which hedge funds were making big moves. 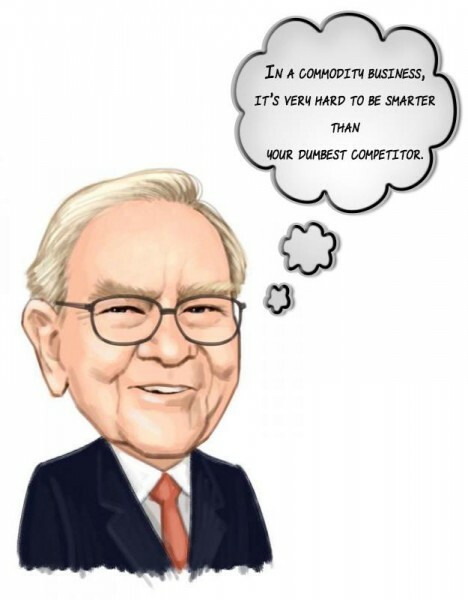 When looking at the institutional investors followed by Insider Monkey, Berkshire Hathaway, managed by Warren Buffett, holds the biggest position in Apple Inc. (NASDAQ:AAPL). Berkshire Hathaway has a $39.3702 billion position in the stock, comprising 21.5% of its 13F portfolio. The second most bullish fund manager is Ken Fisher of Fisher Asset Management, with a $2.0138 billion position; 2.8% of its 13F portfolio is allocated to the company. Other hedge funds and institutional investors that are bullish contain Ken Griffin’s Citadel Investment Group, Cliff Asness’s AQR Capital Management and Phill Gross and Robert Atchinson’s Adage Capital Management. Now, key money managers have jumped into Apple Inc. (NASDAQ:AAPL) headfirst. Renaissance Technologies, managed by Jim Simons, assembled the most outsized position in Apple Inc. (NASDAQ:AAPL). Renaissance Technologies had $435.4 million invested in the company at the end of the quarter. Jonathon Jacobson’s Highfields Capital Management also made a $157.7 million investment in the stock during the quarter. The other funds with brand new AAPL positions are Michael Kharitonov and Jon David McAuliffe’s Voleon Capital, Charles Lemonides’s Valueworks LLC, and Frank Brosens’s Taconic Capital. Let’s now take a look at hedge fund activity in other stocks – not necessarily in the same industry as Apple Inc. (NASDAQ:AAPL) but similarly valued. We will take a look at Amazon.com, Inc. (NASDAQ:AMZN), Alphabet Inc (NASDAQ:GOOGL), Alphabet Inc (NASDAQ:GOOG), and Berkshire Hathaway Inc. (NYSE:BRK-B). This group of stocks’ market valuations are similar to AAPL’s market valuation. As you can see these stocks had an average of 135.5 hedge funds with bullish positions and the average amount invested in these stocks was $16427 million. That figure was $48320 million in AAPL’s case. Amazon.com, Inc. (NASDAQ:AMZN) is the most popular stock in this table. On the other hand Berkshire Hathaway Inc. (NYSE:BRK-B) is the least popular one with only 87 bullish hedge fund positions. Apple Inc. (NASDAQ:AAPL) is not as popular as Amazon and Alphabet Inc. but it is still one of the 15 most popular stocks. Our calculations showed that top 15 most popular stocks among hedge funds returned 19.7% through March 15th and outperformed the S&P 500 ETF (SPY) by 6.6 percentage points. Hedge funds were also right about betting on Apple Inc. as the stock returned 18.5% and outperformed the market by more than 5 percentage points.